Annapolis Taxi Service is a leading company in the taxi and transportation industry within Annapolis, Arnold and surrounding areas. One of our main services is 24/7 airport shuttle or airport transportation, and we cover both international and domestic airports. Taking a taxi to drop you at the airport before travelling is very convenient, especially when there’s no one to take you there or you just want to avoid asking for it. We provide affordable airport shuttle services; and our cabs will deliver all the comfort, space and safety you need and expect. 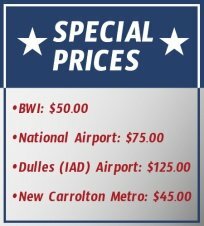 Contact Annapolis Taxi service or call us now at 443-995-1400! When asking for a cab service for airport shuttle, there are some simple things you may expect. What makes Annapolis Taxi Service different than other taxi companies is the importance we give to them: Safety, Comfort, Availability and Value-based Pricing. Our friendly cab drivers will always treat you in a polite and friendly way, as client satisfaction is their main priority. Don’t hesitate and request our 24/7 airport transportation service now! Call Annapolis Taxi Service at 443-995-1400! We pick up and drop off from Arnold going to any airports or bus stations or taking a ride to go to Annapolis downtown for bar visits or restaurant visits.